Dr. G. Jane Cook is the chief research scientist at The Corning Museum of Glass. In addition to her responsibilities researching and sharing scientific and technical topics in glass, she is also the scientific advisor overseeing the new Specialty Glass Residency Program offered by The Corning Museum of Glass and Corning Incorporated. In December, Dr. Cook hosted world-renowned artist Albert Paley, the first artist selected to participate in the residency program, and generously agreed to share her experiences in a series of blog posts, the first of which can be found here. during Paley’s visit to The Corning Museum of Glass in December. Albert is a great experimentalist; like a research scientist or inventor he sees every action as a learning opportunity, a process in which the only failure comes from not observing or considering – every experience has value in either producing a piece, or instructing the next attempt. It was in this mode that Albert worked during the three days in the hot shop. 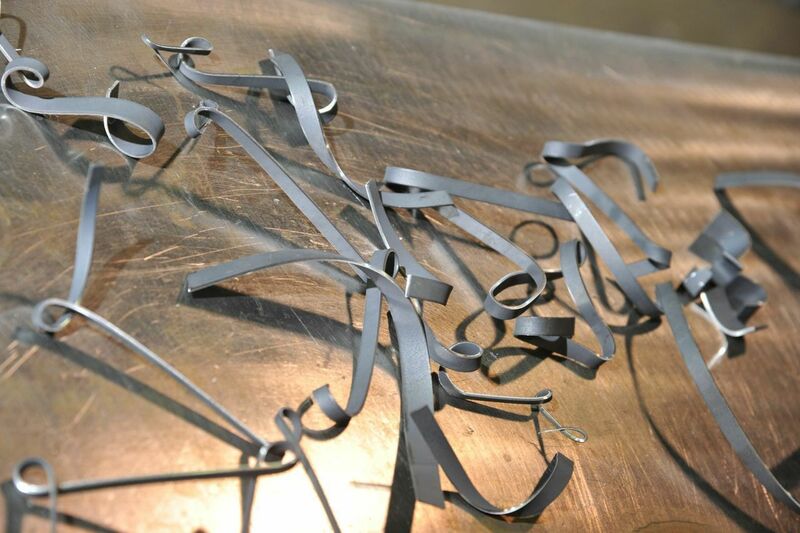 Metal elements ready to be incorporated into larger works. Over several weeks leading up to the workdays, Albert had worked in his studio in Rochester to forge several hundred pounds of Kovar metal stock into “elements:” objects created based on his aesthetic vocabulary of forms, that could be combined with the hot glass in Corning. After being shaped by Albert, all the pieces were sand blasted and cleaned to the Kovar’s gentle luster of silvery-grey; they were then all heat treated at Sullivan Park to form the patina needed for bonding, which imparts a very dark matte gray finish. It was that coloration that would be in contrast with the water-white brilliance of the low-iron borosilicate. Tuesday morning the whole team gathered over breakfast for introductions, and to hear Albert provide his overall goals for the next three days. A diverse set of backgrounds and capabilities were represented in the group: Albert, artist and blacksmith; Albert’s longtime friend and assistant, Mike Cardillo, metal fabricator and jack-of-all-trades; me, a materials engineer and inventor, schooled and experienced in metallurgy, ceramics, and glass science, but with a life-long interest and avocational practice in art; Michelle Wallen and Glenn White, from Corning Incorporated, both senior materials processing technicians who’d been critical enablers of the previous Paley work there; Harry Seaman, glassblower, artist, and manager of The Studio hot shops; and a team of master glassblowers and artisans from the Hot Glass Programs (Hot Glass Show, GlassLab): George Kennard, who was the gaffer for the Paley engagement, and Eric Meek, Chris Rochelle, and G Brian Juk. Additional assistance came from the Studio staff and Hot Glass team in getting the facility set up, and keeping things running. 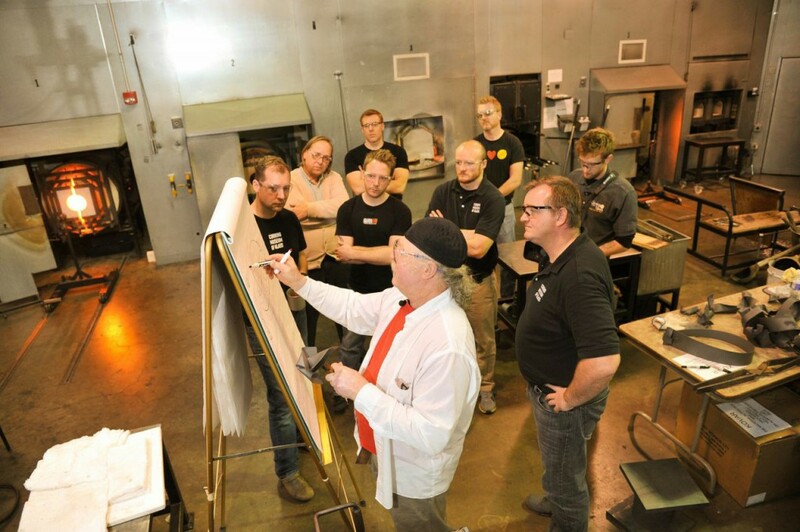 The Studio staff and Hot Glass team look on as Albert Paley creates a sketch. In that first day of work the team managed to put five finished pieces “in the box;” that is, five combinations of metal and glass were declared “complete” by Albert and made it into the annealer safely. Not a single piece was dropped this day – a great accomplishment given the complexity and weight of the forms produced (25-50 pounds, up to 3 feet long, and 18” in cross-section), and the ever-experimental, on-the-fly adjustments nature of the process. The pieces were generally evolutionary beyond the pieces created in August – blown and bonded forms into folded plate metal or coiled, sinuous elements, and glass-as-glue assemblages of metal elements; but confidence born of experience pushed the works into more expressive, complex interplays. In the evening, the team dined together, sharing stories over fine food and drink, until “gaffers bed time” was declared by Hot Glass Programs manager Steve Gibbs at 9:30, to ensure all would be well-rested and not over-celebrated come 8 AM. Still, Wednesday morning came early, and the coffee pot placed just off the work floor of Hot Shop A was empty by 9:30. The team was ready when the irons and glory holes were hot at 8:30, though. This was a grand day of experimentation, groundbreaking work, both for Paley personally, and for the glassworking world. For Albert, he embraced the idea of creating a piece that would be a hollow form that was unabashedly suggestive of a vessel. In his work with glass over the last 20 years, he had avoided the upright hollow form, as it can be difficult to divorce associations with the deeply ingrained, utilitarian sense of such a form being a container: that association can distract from the appreciation of the shape for its shape alone. However the quality of the glass and the sensuality of process suggested expressions to Albert that he could not refuse. And for glassworking, beyond the obvious groundbreaking nature of the Kovar/7056 interplay, a new kind of blending of the materials was achieved: bits of Kovar in the form of shavings from a metalworking lathe, coils and curves about ¼” in size had been created beforehand in the machine shop at Sullivan Park, and given the requisite heat treatment to promote glass/metal bonding. A piece created by Albert Paley during the residency. These were laid out on a piece of kiln shelf, preheated on a pastorelli, and then rolled into the glass, as a glassworker would coat a gather with frit. Experimentation discovered that this was best accomplished with the assistance of a torch heating the shavings as the glass rolled them up. As compelling as the process was to watch, the strikingly beautiful contrast of flecks of black in clear created after casing over the coils, blowing and attaching the glass to more Kovar, and the finished pieces exceeded the expectations of all. 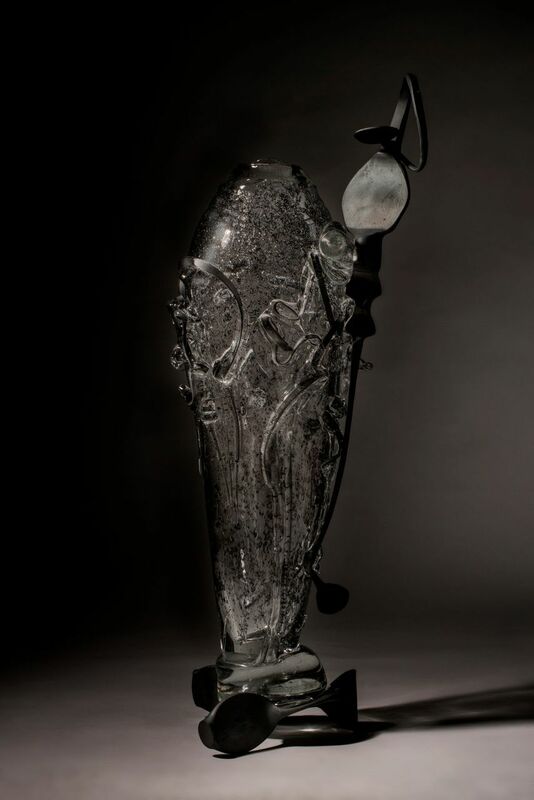 One piece, in particular, an urn-like, upright form, uniquely Paley with a forged handle-like element, and sheared metal twigs attached by trails of streaming glass, and enhanced with the small, embedded Kovar coils, is a glorious work. Four pieces made it to the annealer this day – again, no drops. 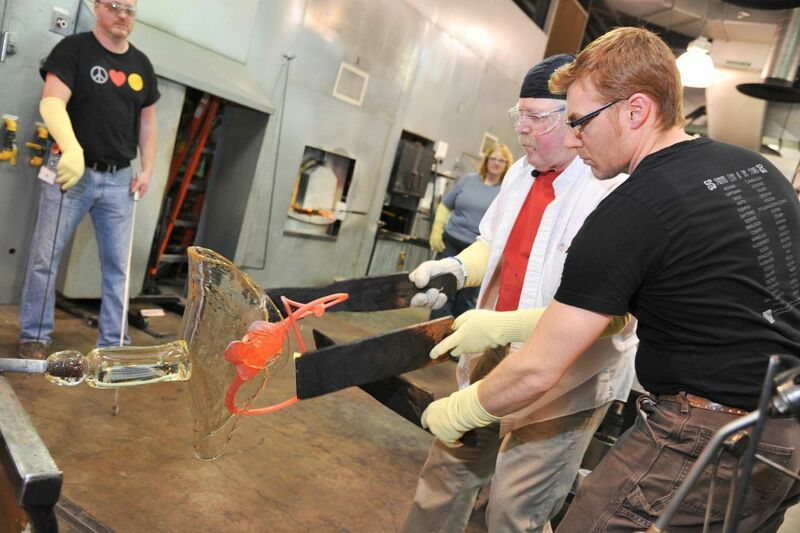 Read more about Dr. Cook’s experience working with artist Albert Paley next week.